It’s always a surprise when I bring a Gewuz to the Thanksgiving table and diners are always surprised by how well it fits the meal. This is Dom Zind Humbrecht’s entry label and at an ARP of $23, I think it’s a bargain. If you’re a traditionalist, you may want to back this up with a Pinot Noir and have both available, but I’ll wager that it will be the Gewurz that empties first. 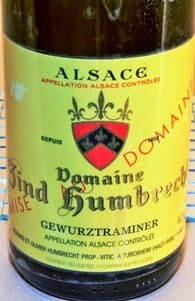 Grapes are grown and the wine crafted in the sub-region of Alsace in France. Throughout history, this area has been part of both France and Germany, but geologically Alsace is isolated from both countries and produces wine that is unique, showing a true sense of place. Ninety percent of what is produced is white and Gewurz is my favorite. common. I never know how many of those tasters are “reaching” and it’s true that each of us enjoy aromas and tastes that others might not be able to detect. But I definitely enjoyed a pungent floral nose with spice and kiwi fruit that was heavenly. The mouthfeel is lush and rich with tastes of dried candied fruit: pineapple and lemon-lime, and hints of ripe pear and orange peel (I didn’t get the white pepper). It has an exquisite minerality in its finish. Even the wine’s color (pale gold) is rich and looks lovely on the table. Just thinking of this wine makes me want more. only the Thanksgiving table. 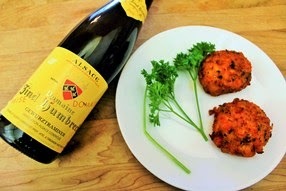 I found it delightful paired with spicy crawfish cakes. It would go well with any grilled fish, smoked meat or several Asian dishes. I can see it accompanying spicy sausages with spaetzle very nicely. All this fruit may lead you to suspect there is sweetness in the bottle, but at 14%, this wine is fermented dry. Look at the lower left hand corner of the bottle’s label and if you spot L170, you’re looking at the same wine I’m talking about. Dom Zind Humbrecht also makes a moderately sweet counterpart with an otherwise identical label but coded L17N. If you enjoy a little sweetness in your wine, you may want to try this. By the way, this wine was ranked by Wine Spectator among the “Top 100” of 2011 and awarded 92 points. Their estimated drink-through date is 2024 which (as I keep saying) busts another myth about all white wines needing to be drunk immediately. If you have trouble getting, this vintage, you may be able to find the 2012, rated 91 points.